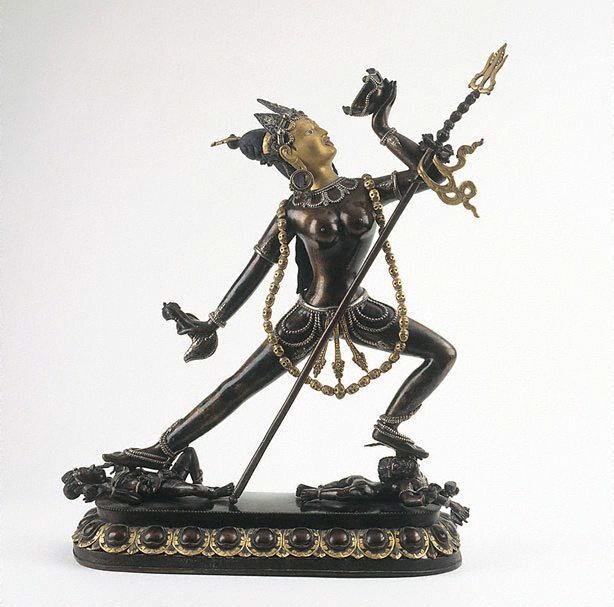 Another epiphany of Vajrayogini that was introduced in India and remains important in contemporary Tibetan practice is Narodakini or Naro Khachoma, readily recognisable by her lunging posture and raised skull bowl. Narodakini is so named because her practice lineages stem from Naropa, the Indian adept to whom she revealed herself in this form. Apart from her distinctive pose, Narodakini shares most of the symbolic attributes and emblems of Tantric female Buddhas discussed in relation to Vajravarahi (p. 203). Another notable difference is that whereas Vajravarahi has an upward-streaming mane, Narodakini has long, unbound tresses. Freely flowing hair is in the Indic setting a mark of a yogic practitioner, especially one who practices Tantra. Buddhist interpreters add another layer of meaning, holding that her untamed tresses signify that her mind is free from all selfishness and attachments and hence flows freely in a state of joyful communion with present reality. Narodakini’s upturned face is poised to drink the nectar of bliss that perpetually flows from her skull cup. She is also said to be gazing toward her Buddha paradise, known as Khechara, ‘Sky-Pleasure’, where those who successfully traverse the Tantric path will ascend at the end of their earthly life and live eternally in her presence in her realm of heavenly splendour and beauty. Upon attaining Buddhahood in her enlightening presence, they can generate their own Buddha-bodies and traverse the universe to guide others to liberation. Miranda Shaw, ‘Goddess: divine energy’, pg.206. Chaya Chandrasekhar, TAASA Review , 'Sacred Symbol, Secret Meeting: the 'Khatvanga' Ritual Staff in Buddhism', pg. 6-8, Sydney, Mar 2006, 6 (colour illus.). Miranda Shaw, Goddess: Divine Energy , 'Dharani goddesses and female Buddhas', pg. 193-209, Sydney, 2006, 206 (colour illus.). cat.no. 129. Look , Sydney, Dec 2003-Jan 2004, 9 (colour illus. ).